My wife and I are trying to identify a plant we bought at Home Depot. No one there knew what it was and we are trying to determine watering schedules and exposure. Any help would be appreciated. It is a Balfour Aralia. It has been pruned back, more like buck horned, drastically, probably because of hail, freeze or wind damage. Not a problem, it will grow back and be beautifull. 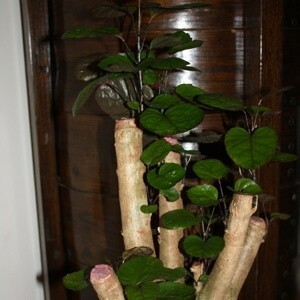 Balfour Aralia prefer a warm room and will suffer if the temperature drops below 65º. They also require high humidity and need high light but not direct sunlight. Extra humidity can be provided by placing the plants on a humidity tray. Balfour aralias should be thoroughly watered and then allowed to dry slightly before they are watered again. Fertilize every 3 weeks during spring and summer with a water-soluble food. In fall and winter, fertilize once a month with a half-strength solution. I doesn't have varigated leaves like the Balfour. The underside of the leaves are a dark purple reddish and no white on the leaves.